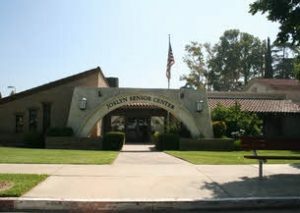 Our winter training location is at the Joslyn Senior Center located in Smiley Park. Parking: On the north and east side of the building as well on the adjacent streets. 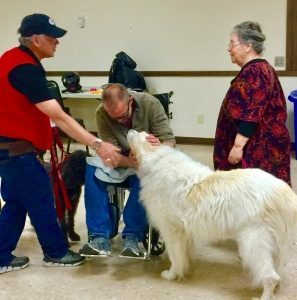 In light of Deborah Salow/Coventry’s kindness and generosity to us at Inland Empire Therapy Dogs, the Board voted to continue to provide a link to Coventry on IETD’s website. We encourage our members and others to consider using Coventry services, including boarding, daycare, training, grooming and supplies, as pet care needs arise. Only dogs (no other animals) are eligible for B&BTD certification and testing is open to all breeds. Dogs must be at least one year of age and must have lived with their owner for 6 months or longer. Dogs that have been aggressively trained (Schutzhund, etc.) or have a “bite history” are excluded. 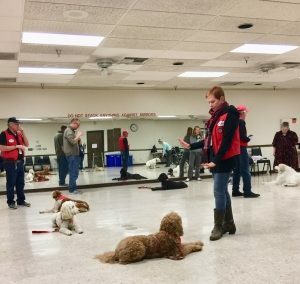 Our staff of Trainers and certified evaluators will work with you and your dog, and evaluate you to determine your potential as a certified therapy dog/ handler team. After the successful completion of at least four training sessions, we will assess your progress and if you are ready, we will schedule an evaluation and testing for certification. You will be tested under the guidelines and standards of The Bright and Beautiful Therapy Dogs, Inc. and Inland Empire Therapy Dogs, Inc.
Once certified, a whole world will open up to you; a world of volunteering, of sharing and giving, and a world where our dogs can make a miraculous difference in the lives of others. 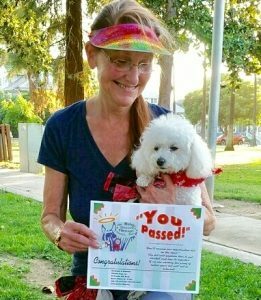 Certification is just the beginning of the wonders of this “Therapy Dog” adventure. 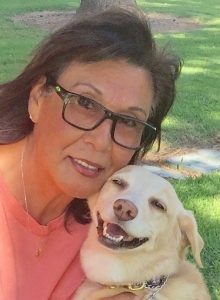 At Inland Empire Therapy Dogs, Inc. we believe in “relationship training”, where we help you to strengthen the bond between you and your dog to more effectively work as a team. Your dog will learn to feel more comfortable among other dogs and find his place in the pack as he builds a relationship with the other dogs. And as a team, you will form a relationship with the other teams in our organization and with the communities that we serve. All memberships expire and are due for yearly renewal on the membership anniversary; a renewal notice is mailed to all members one month before their expiration date. Come to us with your dog reasonably trained in the basic commands, sit, down, come, stay, walk loose on a leash. A desire to engage in and promote the ideals of animal assisted therapy and animal assisted activities. 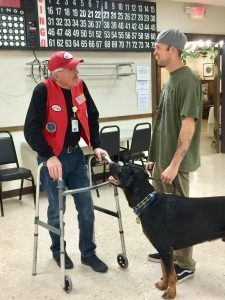 A willingness to volunteer your time and energies with your dog to bring wellness and joy to others in hospital, educational, and community settings. Join us as a member of our IETD family. Train with us, play with us, visit medical facilities with us, and participate in community events. Consider joining our R.E.A.D. program where children learn to read by reading to our dogs. You can expect us to give you the training, guidance and support to become a certified therapy dog/handler team. Our leadership and training teams have years of experience, but each of us started where you are now. We will guide and assist you every step of the way. 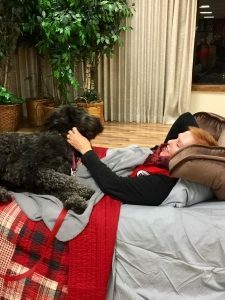 When you reach a level of proficiency that is commensurate with the standards of Bright and Beautiful Therapy Dogs, and Inland Empire Therapy Dogs, we will evaluate and certify you and your dog as a Therapy Dog Team. We will welcome you into our family and mentor you through the processing and protocols of the various facilities where we visit. We will assist you and your dog in learning the finer points of patient interaction and hone your skills to make these interactions with the patients more meaningful and rewarding.